Location: Mershon Center for International Security Studies, 1501 Neil Ave.
"Exceptional Iberia or Normative Mediterranean? Contexts of Ethno-religious Relations in the Middle Ages"
Medieval "Spain" has long been portrayed as a unique case of ethno-religious diversity, and Muslim-Jewish-Christian relations, whether this is taken in a "positive" sense, as in Castro's paradigm of convivencia, or in the "negative" sense of Reconquest and Expulsion. Neither of these paradigms holds up to close examination, and each is based on a selective reading of sources; together they disguise a dynamic of ethno-religious interaction that is much more ambivalent and complex. 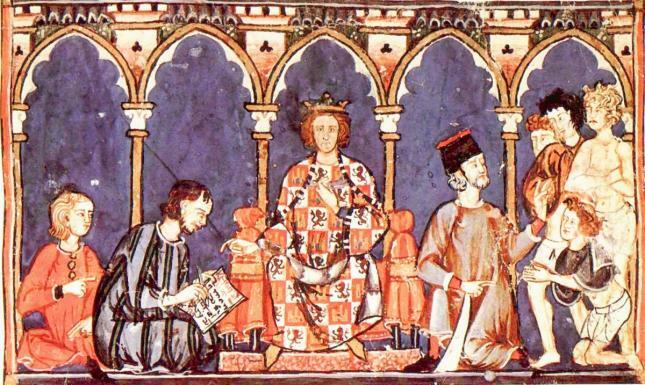 Moreover, such relations are not particular to the Iberian peninsula of the Middle Ages, but rather characterize ethno-religious relations across the Medieval Mediterranean. "Exceptional Iberia or Normative Mediterranean?" seeks to place Muslim-Christian-Jewish relations as can be observed in the Iberian peninsula in a Mediterranean context and suggest an alternative to both the nostaligia of convivencia and the anachronistic vision of a clash of civilizations. Since 2010, Brian Catlos has worked as an Associate Professor of Religious Studies at the University of Colorado at Boulder, with cross-appointments in History, Humanities and the Jewish Studies program. He studies the dynamics of the social, economic and cultural interaction of ethno-religious groups in the Medieval Mediterranean, especially Christians, Muslims, and Jews in Iberia. In 1994, he received a B.A. in History and Philosophy from the University of Toronto (Canada), and an M.A. (1996) and Ph.D. (2000) in Medieval Studies (History) from the Centre for Medieval Studies.